Sikkim is blessed with the most vivid strokes on Nature’s canvas – surreal landscapes, dreamy misty mountains and valleys that make you wonder if you’ve landed in paradise. 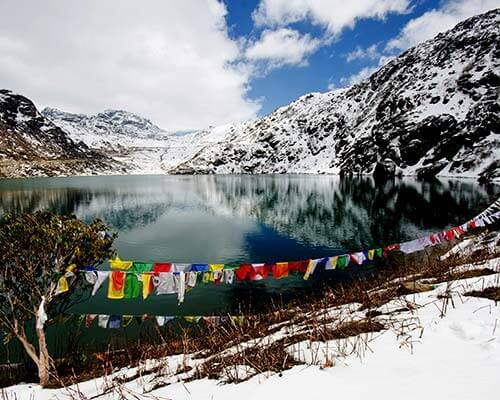 The essence of all that Sikkim has to offer is wrapped up in this idyllic North Sikkim hamlet, Lachung. Tall majestic snow-clad Himalayas, sparkling mountain streams and waterfalls, bountiful fruit orchards and meandering blue rivers complete this perfect picture of untainted and untamed nature in all its glory at Lachung Valley. 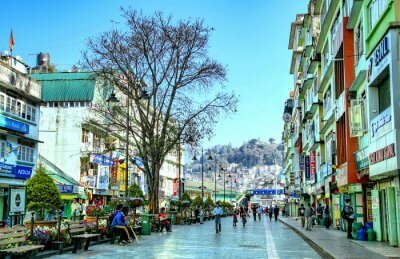 Well-connected with Gangtok, the Lachung valley is a 6-hours’ drive from the capital city along a winding road offering breathtaking views and an exhilarating experience. The scenic drive along the mountains will make you believe that the journey itself is as rewarding as the destination. 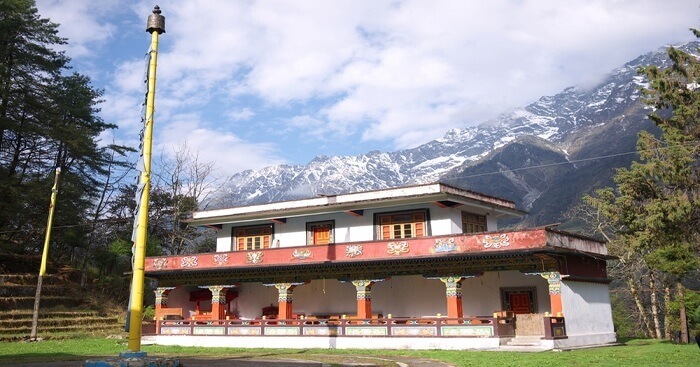 While exploring the village, the Lachung Gompa (monastery) is a tranquil place to spend time admiring the beautiful wall murals, ancient sculptures and letting the peaceful vibes nourish your soul. If you happen to visit the monastery during some important Buddhist festivals like the Saga Dawa (celebrating Buddha’s birth, enlightenment and death), Chaam (masked religious dance) or Lossong (the harvest festival and New Year of Bhutia people), you get a chance to witness the local traditions and culture more closely. The handicrafts and carpet weaving centre in Lachung valley displays exquisite woollen carpets, rugs and shawls crafted by the locals. 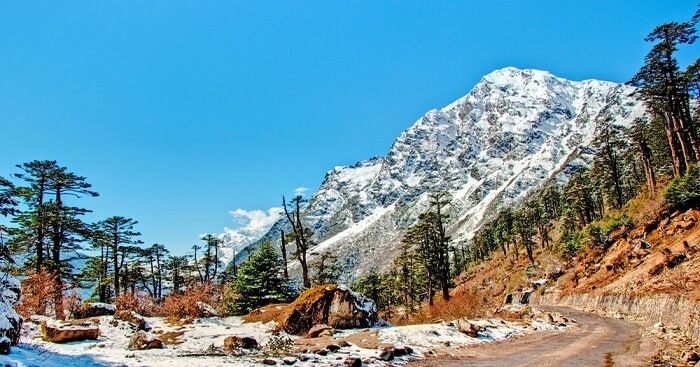 A 40-minute drive away from Lachung is the snow bound landscape of Mt Katao close to the Indo China border. Due to its proximity to the border, permission must be sought from the Army before visiting the place. While this is a winter wonderland from November to March, Mt Katao is equally captivating during the spring and summer months. 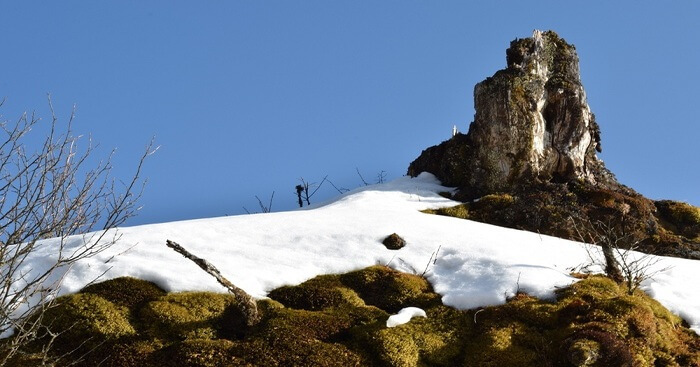 At a dizzying 15000 feet, Mt Katao would charm both nature lovers and adventure seekers with its snow-capped peaks and is a must visit for some unforgettable moments of fun and adventure in the snow. 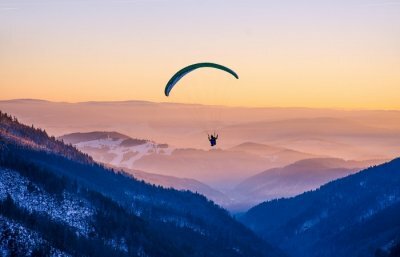 In the winter months there’s snowboarding, skiing and snow-tubing to lure the adrenaline junkies. 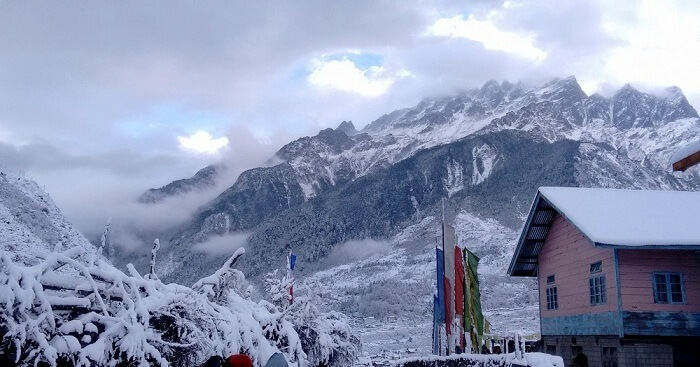 The thrill of holding fresh snow in your hands, playing with snow and making your own snowman while witnessing the golden rays of the sun dance on snow peaks, is how you will remember those precious moments spent at Mt Katao. Imagine being greeted by a canvas of wildflowers in myriad hues for as far as your eyes can see! Sikkim’s very own ‘valley of flowers’ is a place of unmatched beauty with rolling meadows, sparkling rivers, hot springs and flowers all around. Home to the Shingba Rhododendron sanctuary, Yumthang valley is studded with about 24 species of rhododendron which is also the national flower of Sikkim. The valley is usually closed from December to March due to heavy snowfall. 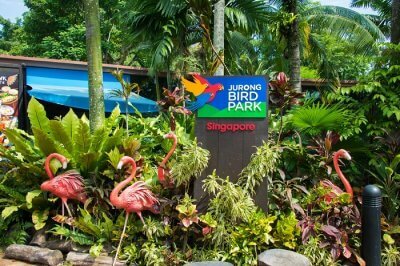 The best time to visit is in the flowering season from April end to mid-June when the valley is a rainbow of colours with hundreds of flowers including rhododendrons, poppies, primulas and irises. Even if you visit Yumthang valley at other times of the year, it’s a lovely place to spend some moments in the lap of nature near the enchanting river flowing through the valley, while you gaze at the silvery snow up above on mountain peaks. 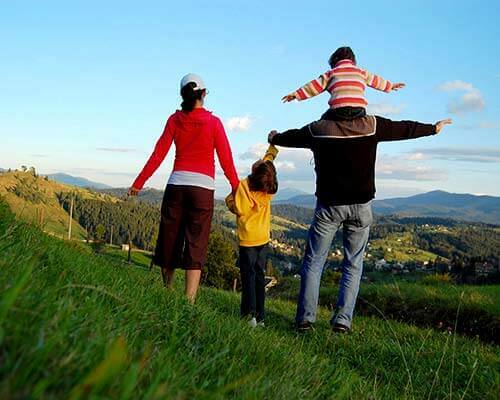 Zorbing through the valley can add some fun quotient to your tryst with nature. Lachung to Yumthang valley distance (about 25 Km) can be easily covered in about 1.5 hours depending on the weather and road conditions. You must plan to spend 2-3 hours at the valley of flowers to do complete justice to this spectacular location. 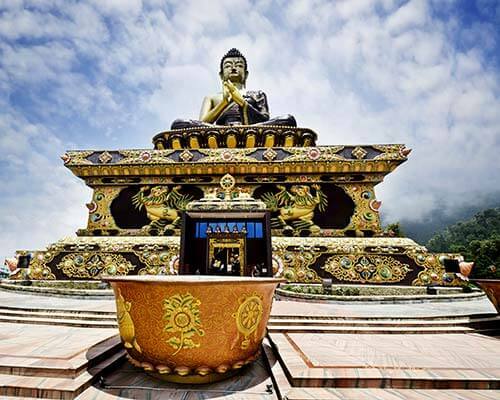 More popularly known as Zero point, this is one of the top attractions near Lachung valley. 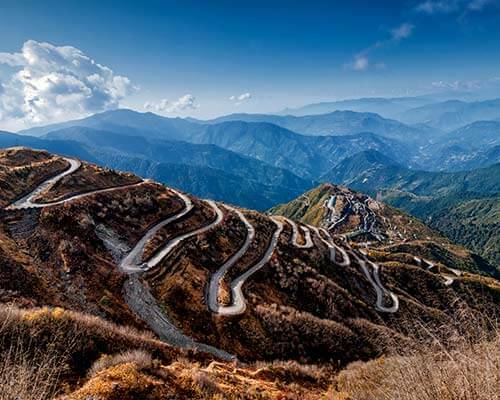 The treacherous mountain road which is often covered in snow during the winters, offers a thrilling experience and stunning views all along the way. Aptly called zero point it is really the end of the road and the last outpost to civilization close to the border with China. Azure skies, snow-capped mountains ranges and surreal views at Yume Samdong will remain etched in your memories forever. 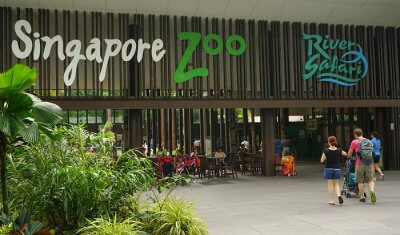 It is advisable to leave early and be back well in time to avoid getting stuck due to snowfall or inclement weather. Since it’s very windy and cold up there, wearing multiple layers of clothes is a great way to stay warm and protected. Despite the slightly tiring route and feeling of breathlessness at this height, you will feel blessed looking around at the breathtaking views with a steaming cup of tea in your hands and a warm bowl of Maggi to dig into. What more is there to life than bearing such close witness to nature’s wonders and losing yourself to the majestic mountains! 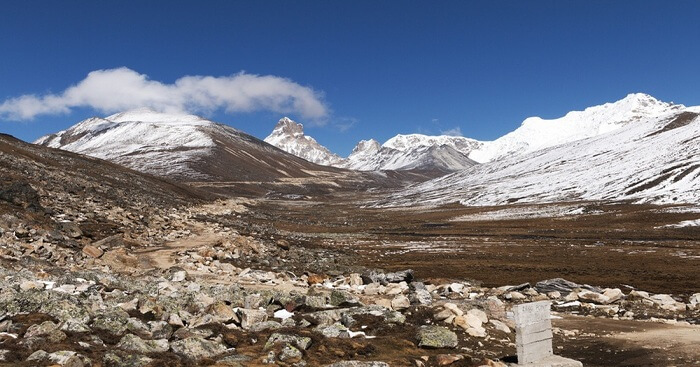 Zero point is further ahead of Yumthang valley and takes about an hour or more to reach. So these two trips can be combined if you plan well and leave Lachung early morning. Enroute to Lachung the Bhim Nala falls are a refreshing pit stop to admire the splashing fall and click some memorable pictures on the wooden bridge with the gorgeous fall in the backdrop. 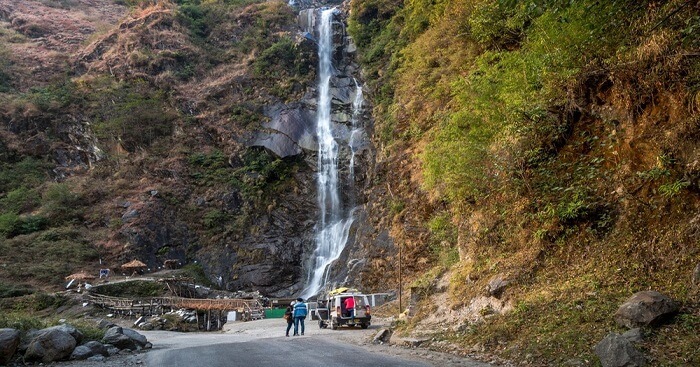 Another dazzling waterfall on the way to Lachung valley is the emerald-hued Naga Falls. While most people stop by and enjoy a warm cup of tea with at the roadside tea-stall, the adventure loving can trek up a little to go close to the water. 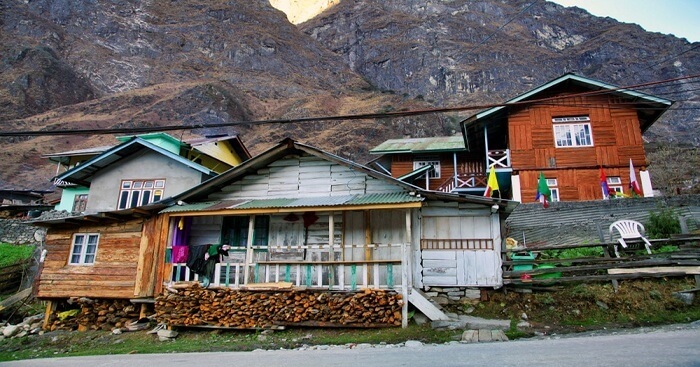 There are plenty of accommodation options in Lachung to relax your weary bodies after all that hill driving and before you continue your mountain adventures to the next destinations. You are welcomed by cherry blossoms as you enter this fantastic hotel, with superb views of the valley and all modern amenities including a salon and spa. 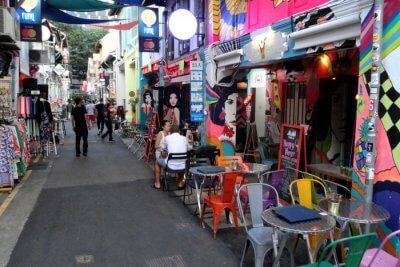 Their warm hospitality, tasty food and picture-perfect location will relax both body and soul. This charming mid-budget hotel offers comfortable rooms, outstanding food and splendid views of the river and snow-capped mountain ranges. With all basic amenities in place and a caring & attentive staff, Norling Zimkhang is a good choice that doesn’t burn a hole in your pocket. A cozy bed & breakfast option, the Apple Valley lets you relax in idyllic wooden cottages overlooking the gorgeous valley. It’s the ideal mountain getaway with delicious home style food and very helpful staff. Suggested Read: 15 Best Hotels In Lachung To Answer The Call Of Mountains In The Best Possible Way! Now that you know all about the wonderful Lachung Valley, it is time you take a visit to this paradise and experience the magic of the mountains. Do tell us how your experience was in the comments section below.